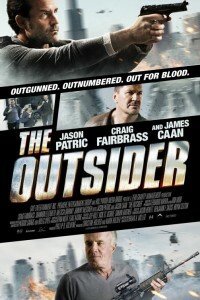 In the movie The Outsider, British mercenary scours L.A. for his missing daughter with the help of a seasoned inner-city detective in this gritty action thriller. Lex Walker (Craig Fairbrass) is fighting on the front lines in Afghanistan when he is summoned to L.A. to identify his daughter Sam’s remains. When the sheet at the morgue is pulled back, however, Lex is alternately shocked and relieved to see that it is not his little girl laid out on the slab. Yet the question remains – if this isn’t his daughter, where has she gone? Convinced that his time to save Sam is quickly running out, Walker talks a local detective (Jason Patrick) into following the trail of clues straight to the wealthy internet entrepreneur (James Caan) who previously employed her. Later, with thugs and assassins closing in from all sides, Walker realizes that the only way to save his daughter is to use the skills he learned in Afghanistan on the mean streets of L.A.
An explosive tale of double cross and revenge, "The Losers" centers upon the members of an elite U. S.